Keystores and the keys within can be used for security on the transport layer and application layer in Oracle SOA Suite and WebLogic Server. Keystores hold private keys (identity) but also public certificates (trust). This is important when WebLogic / SOA Suite acts as the server but also when it acts as the client. In this blog post I’ll explain the purpose of keystores, the different keystore types available and which configuration is relevant for which keystore purpose. Why use keys and keystores? 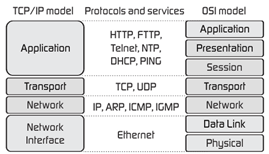 The below image (from here) illustrates the TCP/IP model and how the different layers map to the OSI model. When in the below elaboration, I’m talking about the application and transport layers, I mean the TCP/IP model layers and more specifically for HTTP. Almost all of the below mentioned methods/techniques require the use of keys and you can imagine the correct configuration of these keys within SOA Suite and WebLogic Server is very important. They determine which clients can be trusted, how services can be called and also how outgoing calls identity themselves. Read the complete article here.